B&W 607 review | What Hi-Fi? As if the decisions we made for the 2018 What Hi-Fi? Awards weren’t difficult enough, part of us wishes we’d seen B&W’s 600 Series earlier. Though it would have made our selection task even trickier, we'd have had more time to revel in the talents of these delightfully energetic 607 standmounters. The 600 Series is the most affordable range in B&W’s catalogue of stereo speakers and, standing just 30cm tall, the 607s are the smallest and most affordable stereo pair in the line-up. To those familiar with B&W’s previous 600 Series speakers, the most notable aesthetic change here is the lack of iconic yellow drivers. Those Kevlar cones are no more, having been replaced by silver Continuum units first seen in the high-end 800 Series. The one integrated into the 607s measures 13cm, and is paired with a decoupled 25mm aluminium tweeter. Decoupling the tweeter from the front panel reduces the degrading effects of the vibrations of the mid/bass driver, and a gentle press around its trim shows a slight give in the design. B&W has also removed the grille pegs from this sixth generation of its 600 Series, opting instead for a magnetic design. The Flowport vent has been moved to the back to achieve a cleaner, sleeker overall image. The 607s are also bi-wireable. B&W recommends positioning the 607s no less than half a metre from surrounding walls, and about 1.5 to 3m apart, toed in slightly for optimum performance. However, their size and design makes these versatile performers even for those without room for manoeuvre. Having run our test sample in, the 607s bound toward us with all the zeal of a puppy greeting its owner. Their energy and enthusiasm is ceaseless, their aim only to make us happy, as long as we keep feeding them. First impressions are of a relatively lively treble response, keen to keep hi-hats present at the front of a mix, but the 607s possess a richness throughout the register that turn this often concerning attribute into a positive. It really just serves to expose just how brilliant their sense of timing is. At the other end of the spectrum, these standmounters are capable of deeper and more authoritative bass response than their diminutive form would suggest. Warbles and pulses we might expect to be compromised with this size of speaker are present, with the kind of tonality and clarity enjoyed elsewhere in the frequency band. Detail levels are predictably good too, with that impressive balance pebble dashed with textural insight, but it is the B&W 607s’ penchant for expression that makes them stand out. Snappy timing is combined with plenty of punch and enthusiasm that simply cannot fail to entertain. Subtlety isn’t in short supply either, with a light touch applied where necessary. The 607s prove they don’t need to shout to be heard, with B&W mastering that infectious quality that urges us to party rather than solemnly reflect. We use the Award-winning Mission QX-2 standmounters (now available for £349) as a direct comparison, and the difference in personality is stark. The QX-2s are more reserved and refined, drawing back from such a forward presentation and allowing their greater physical bulk to deliver a heftier performance. But they just don’t have the sense of urgency or the punch of the B&Ws; they’re seemingly less inclined to have us off our seats. Placing the 607s against the larger 606s illustrates B&W’s pricing policy clearly. The latter pair offer a predictably bolder, fuller presentation, but also an upgrade in terms of dynamics, which aids the organisation of trickier, more complex rhythmic patterns. For those with the space and budget to stretch, there is reason to do so with the 606s, which build on their smaller siblings’ talented performance while retaining that instantly likeable overall character. 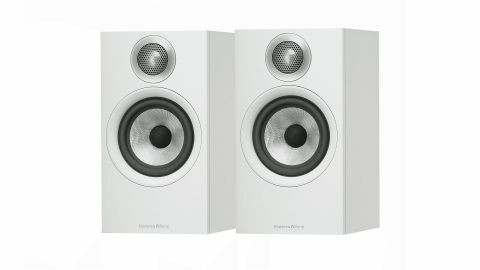 For a pair of standmount speakers costing less than £400, you’d do well to beat the B&W 607s. Energetic, insightful and riotously entertaining: they may have missed the boat for Awards contention in 2018, but the race for this year’s title could already be hotting up.